Are you coming to World Congress? SYAI is here to support you to get to World Congress and keep you in the loop as well 🙂 Click on this flyer for more information…. If you are coming to World Congress and want to help spread the word about how others can get there or you to organise some fundraising so others can attend please sign up as a World Congress Ambassador (WelcomeAmbassadors_Oct2013) If you want to be an instant help please forward a link to this blog and tell people why you are planning on going! 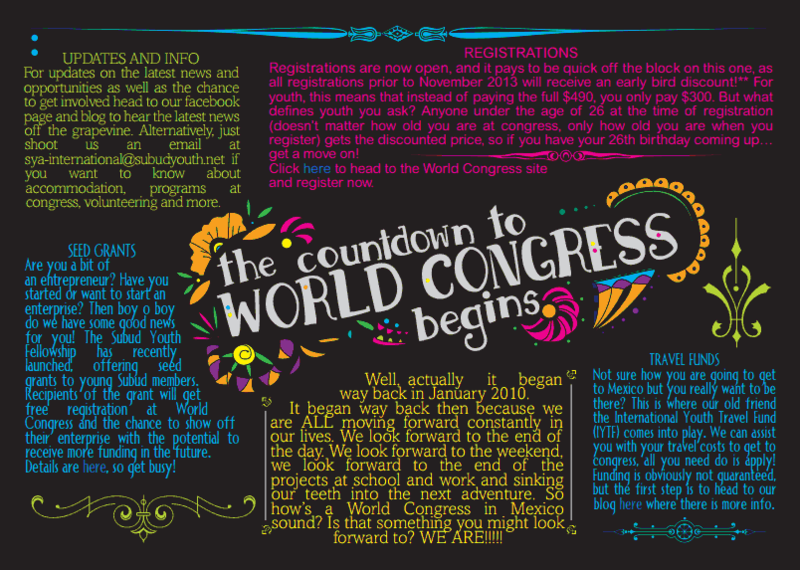 Do not forget that early bird registrations close on the 30th of November so head to http://subudworldcongress2014.com/about-congress/ and register! We are working on the program for world congress for youth …. what do you want to see and do while you are at congress? ← Today: Envoy on Youth at the United Nations – follow the livecast!